Gloucester City Council Liberal Democrat group have issued their ten-point plan to improve services in Gloucester. The manifesto “Keeping Gloucester Moving Forward” focuses on how the Liberal Democrats will do better in regenerating Gloucester and improving council services in the future. Group Leader Jeremy Hilton said: “Liberal Democrats have an imaginative ten point plan to improve services of the city council. We will progress the regeneration of our historic city, with more panache and urgency than the current Tory administration. Deputy Leader Cllr. Sebastian Field said: “Gloucester as a city is on the up, with regeneration projects happening all across the city. But in many areas of the city, the Conservative council has failed to live up to its promises. 1) Regeneration of our city is a top priority. King’s Quarter has been delayed again and again. We will make sure that the city centre is not forgotten, and will press developers to deliver on time, with developments that local people actually want. 2) Our idea to provide free wifi in Gloucester city centre is being implemented. We will make sure it is delivered in time for the Rugby World Cup. We will create a modern welcome for visitors to our historic city. 3) Liberal Democrats in Gloucester are working to ensure there are clean, modern public conveniences in the city centre. The Tory administration’s Community Toilet scheme is a failure, and Gloucester deserves better. 4) Gloucestershire Airport Ltd (GAL) is owned by the city council, jointly with Cheltenham Borough Council. We shall continue to support GAL as a general aviation airport to provide jobs and air transport services. We shall also deliver our plans to enhance the railway station and the building of a new central bus station. 5) We will lobby the government to provide better infrastructure for Gloucester, from roads and public transport, to superfast broadband for all new developments. 6) We have consistently opposed the massive waste incinerator planned for Javelin Park, Quedgeley. Local Tories on the county council rammed this plan through with the help of UKIP councillors, despite it being unanimously rejected by the planning committee. We will ensure that household waste that is collected by the city council is not burnt in an incinerator when it can be recycled. 7) Gloucester Liberal Democrats will listen to the residents of Gloucester in making their budget decisions. In these challenging times, councils have to make tough choices and innovate to save money and create revenue. We will listen to all ideas for how best to do this. 8) Gloucester Cathedral is a magnificent building at the heart of our city. It could be a World Heritage Site, which would make it even more of a tourist attraction. Liberal Democrats chair a group trying to make this happen. 9) Gloucester has a rich heritage and cultural history. We currently do not have an Arts Council-supported venue in the city, and we would work to make that a reality. Gloucester should be a creative hub for artists, writers, musicians and performers. We will bring more Festivals and events to Gloucester, including a literary festival. 10) Gloucester Liberal Democrats will ensure that the Rugby World Cup is a fantastic celebration enjoyed by all. The city must be spotlessly clean and there must be adequate facilities to accommodate all the extra fans. The council must work with England Rugby to ensure a lasting legacy from the World Cup. We will assist Gloucester City Football Club to return home to Gloucester in their plans to build a new stadium at Meadow Park. 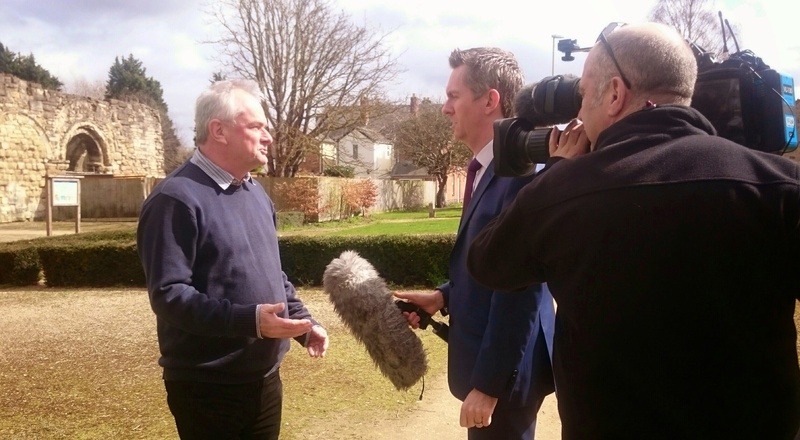 Jeremy Hilton explains his vision for Gloucester and why he is standing for parliament. I was born in Gloucester and I have lived and worked within ten miles of the Cathedral all my life. Having served Gloucester for more than 23 years as a local councillor, I believe I can do an excellent job of representing our historic city in Parliament. If elected, I would be the first MP to represent Gloucester, who was born here. It would be a great honour to serve as a Member of Parliament for this city, which has been my home for so many years. I am proud of the achievements of the Liberal Democrats in government. We have worked hard to deliver our manifesto, from the Pupil Premium that is helping disadvantaged children, to the ‘triple lock’ that means pensions rise by at least 2.5% a year. The increase in the income tax threshold means people can now earn £10,600 tax-free. Vince Cable has led the way on delivering two million new apprenticeships, which equates to more than 1,000 in Gloucester every year. I remember Labour’s attempt to stamp on our civil liberties with compulsory ID cards. This was scrapped by the Lib Dems in government. In Gloucester, we must see the regeneration of our city to completion. This will mean the delivery of an upgraded railway station with improved connectivity and a new bus station. As the MP for Gloucester, I will want to complete the work I have started on a bid for UNESCO World Heritage Site status for our magnificent Cathedral. Too many Gloucester children leave the city to go to secondary school – this is unfair. I will work to ensure that young people from Gloucester are able to get into good local schools. Fighting Labour’s plan to nationalise or regionalise the fire service, which would see the end of our county fire brigade, would be on the top of my list as a new MP. I remember successfully fighting Labour over plans to move our fire control to Somerset. This year’s county council budget setting meeting commenced after the morning’s extraordinary meeting over the incinerator. The Liberal Democrats presented a comprehensive package of recommendations over a range of different service areas including cycling schemes, health, fire emergency support, Wi-fi, adoption and road safety. 1) A £100K investment to undertake the necessary feasibility and advance design work in preparation for delivering cycling schemes in future years. 2) A £10K investment funded from the Sexual Health part of the Public Health ring fenced Grant to carry-out a study into Chlamydia/STI screening and the role of GPs across the county in encouraging more opportunistic screening. 3) That approximately £100K be invested to provide free Wi-Fi in every county and community library. 4) That every elected county councillor in 2015/2016 receives an additional £2.5k (53 x £2.5K = £132.5K as part of a one-off increase to their ‘Highways Local’ money, which may be used for tree maintenance and/or tree planting in their division. 5) That a £10K one-off investment is given to the Red Cross Fire Emergency Support Service in order to double the number of volunteers from 12 to 24. The Red Cross Fire Emergency Support Service provides invaluable support to Gloucestershire Fire and Rescue Service. 6) A £10K pot of money to provide support in the form of courses for those approved adopters who adopt older children and teenagers where risk of disruption is recognised to be high. The aim is to further support these placements and reduce the chance of the placement breaking down. 7) £50K one-off investment package into a number of Road Safety Programmes including a repeat of all Year 5 pupils at Gloucestershire’s primary schools being given the opportunity to have a session at Gloucester’s SkillZone. 8) That a £20K one-off investment is given to the Child Sexual Exploitation (CSE) Team to work towards doubling the number of children who receive e-Safety in 2015/2016. “Users of our public libraries will be delighted that free WiFi will be available in all libraries. Liberal Democrats in Gloucester have welcomed plans announced by Party Leader Nick Clegg to cut the deficit without putting an unfair burden on the poorest. Whilst the Conservatives have announced that they want to balance the nation’s books entirely by cuts to benefits of the working age poor, Liberal Democrats say they will increase taxes on the wealthiest and cut tax avoidance. “We have all had to make sacrifices over the past few years to clear up the financial mess left by Labour. Since the Coalition was formed, we have had to cut spending on benefits and some services though we have protected schools and the NHS. “As a local councillor in Gloucester it has been hard for me and my colleagues to make savings in the council budget whilst maintaining the services people pay for. “But Lib Dems in Government have also increased taxes on the wealthiest whilst cutting income tax for people on low and middle incomes. This would not have happened if the Conservatives had won a majority at the last General Election and formed a single party Government. “Now the Conservatives have announced if they win the election, they will complete the job of balancing the books entirely on the backs of the working age poor. They have revealed their true approach to austerity and public services. “Meanwhile Labour appear to have learnt nothing over the past five years. They opposed every cut that needed to be made. If they form a single party Government after the election, they will put back the date when the books are balanced, leaving Britain in more unnecessary debt. In response to the costs associated with cancelling the UBB incinerator contract that have been shared with the Liberal Democrat Group. “We have seen the figures for exiting the waste incinerator contract with UBB and it is astronomical. The figures quoted are between £60m and £100m, which is far greater than the £33 million quoted for cancelling a similar contract in Norfolk. “Labour have acted irresponsibly in calling to cancel this contract before knowing these costs. The Conservatives were reckless in signing such a rigid contract before the planning committee had even considered the application. “The Liberal Democrats have always been opposed to the building of an incinerator and have continually pushed for alternative technologies such as Mechanical Biological treatment (MBT). “We will now be looking at these figures in detail and seeking legal advice. 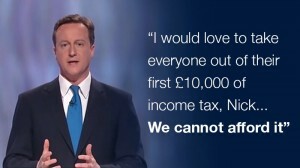 Here’s what David Cameron had to say about the Liberal Democrat plans for a £700 tax cut at the 2010 election debates…. Now that we’re delivering it in government, the Conservatives are trying to pretend it was their idea in the first place! The truth is, it’s only thanks to the Lib Dems that 24 million people are getting a £800 tax cut. Without us, it just wouldn’t be happening. The income tax free threshold will be £10,600 in April this year, we intend to increase this still further so that no one earning less than £12,500 will pay any income tax at all. Jeremy Hilton, Liberal Democrat parliamentary candidate for Gloucester has urged places of worship, serving Gloucester to apply for a new £15million fund available for the repair of roofs and guttering. The fund is available for churches, mosques, temples, gurdwaras and synagogues. The Coalition government announced the Listed Places of Worship Roof Repair Fund in the Autumn Statement and grants between £10,000 and £100,000 will be available to listed places of worship of all faiths and denominations across the UK, where roof repairs are deemed to be urgent and necessary. Jeremy Hilton said: “Places of worship play a huge part in many people’s lives in Gloucester and this fund will help ensure some of our most significant buildings remain open as safe and sustainable places in our communities. Applications for a grant must be made by midday on 30 January 2015, with awards to be allocated by the end of March 2015. Enquiries can be made by email to enquiries@lpowroof.org.uk or telephone 01392 223 979. Further information about the scheme is available online by visiting www.nhmf.org.uk and clicking on the link to the Listed Places of Worship Roof Repair Fund. The government should introduce voting for 16 year olds in time for the General Election, says Liberal Democrat parliamentary candidate for Gloucester, Cllr. Jeremy Hilton. Mr Hilton said: “It would be great if legislation could be passed by parliament to enable 16 and 17 year olds to vote on the 7th of May next year, but unfortunately the Tories are against, they want to keep the voting age at 18. “I am delighted that the Liberal Democrat manifesto will give a commitment to introduce legislation to allow 16 year olds to vote. “The evidence from the Scottish referendum clearly showed that 16 and 17 year olds engaged in the political process in a mature way, with a turnout in this age group of 75%. 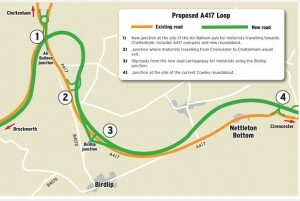 Today the coalition government has reserved millions of pounds towards improvements along the A417 at the Air Balloon. 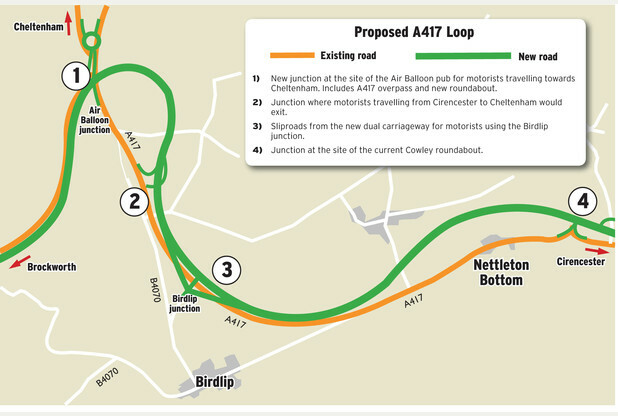 These improvements will see the road converted to a dual carraigeway from Brockworth to Cowley roundabout. The estimated cost is £255m. Liberal Democrat parliamentary candidate for Gloucester, Jeremy Hilton has welcomed the government announcement. Jeremy Hilton said: “The A147 along the missing link is congested and dangerous. Upgrading it to a dual carriageway will improve road safety and reduce congestion. Pollution levels will go down. Connectivity will get better, enhancing travel times from Gloucester to London and the South East This should boost the economy in Gloucestershire and create new jobs. Graphic safety messages should be displayed on all e-cigarette chargers say fire authorities, after shock new statistics show a surge in fires connected to the devices. Latest reported figures from fire services up and down the country reveal that since 2012 they have attended 113 calls to e-cigarette-related blazes. There were just eight call-outs in 2012 but this soared to 43 last year and there have been at least 62 so far this year. This means firefighters are now dealing with e-cigarette related incidents at more than one a week. The Local Government Association (LGA), which represents all 46 fire and rescue authorities in England and Wales, fears that these are the “tip of the iceberg” and many cases go unreported. The warning comes during national Electrical Fire Safety Week, which is run by the Electrical Safety Council charity. E-cigarettes have rocketed in popularity and are now used by an estimated 2.1 million Britons each year. These latest statistics come just weeks after a 62-year-old man died when an e-cigarette battery on charge exploded and ignited oxygen equipment he was believed to have been using. Fire chiefs say many blazes are taking place because smokers are not using compatible chargers. This means too much current goes into the batteries and they overheat and eventually explode. Battery material shoots out – up to two to three metres in distance – and can cause a fire if it lands on anything combustible. Now the LGA is calling for e-cigarette manufacturers to do more to warn of the dangers. This includes displaying prominent safety warnings, highlighting this issue, on e-cigarette kits and chargers. Cllr Jeremy Hilton, Chair of the LGA’s Fire Services Management Committee, said: “The spiralling upward trend of fires connected with e-cigarettes is a major cause for concern and much more needs to be done to combat it. We expect this to continue to rise as more smokers switch to e-cigarettes. Alarmingly, there is no way of knowing the true figure as we understand many cases are going unreported. “We are urging e-cigarette manufacturers to introduce clear, prominent and graphic new warnings spelling out to users the dangers of using incompatible chargers with e-cigarette batteries. “Tragically, at least one life has been claimed and more fatalities could follow unless this issue is addressed rigorously and robustly. * Ensure that you dispose of batteries correctly.